Beautiful Day: Happy Valentine's Day!! Valentine's Day is a sweet celebration. I love it! This is one of my fave love songs and videos from the eighties. and have the happiest of days! 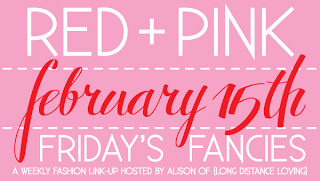 Also linking up with long distance loving to see some more red and pink outfits. Gorgeous set, loving all the pink. Great song!! Still love listening to Belinda. That dress is SO Cute! Loving it! i love valentine's day, too! and that dress really caught my eye! LOVE that dress, and I am a huge fan of desserts in jars :) Aorable!